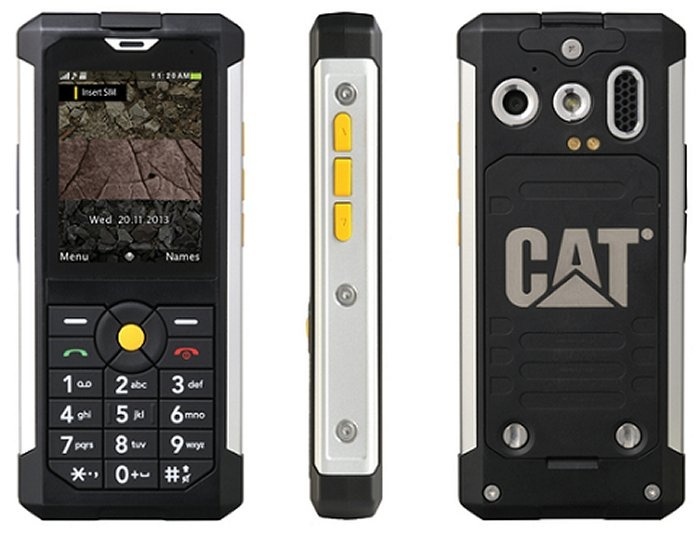 CES 2014: Cat B100 Phone is Tough As Nails | OhGizmo! Rugged and outdoorsy types, this is the phone for you. Many phones that are geared for people with active lifestyles have been released by various manufacturers over the past few years, but none are quite like the Cat B100 by Caterpillar. The brand takes “rugged” to an entirely new level, as the B100 is IP67 certified and provides MIL 810G protection. That’s coded speak for dust-proof and water-proof, and it can be immersed up to three feet deep. It’s also shock-proof and will keep on working even after it’s subjected to extreme temperature changes. The Cat B100 features a 2.2-inch 240 x 320 resolution display and is equipped with a 3-megapixel camera. That might not be much compared to most other phones, but you have to keep in mind that this probably wasn’t meant for people who take a gazillion and one selfies or food shots a day.